Bulls is brand of ZEG (Zweirad-Einkaufs-Genossenschaft). ZEG is besides a ‘purchasing cooperative’ also producer of some own brands like Pegasus, Bulls and Yazoo. Bulls is known for its relative low price and decent quality which makes it an ideal buy for people who can’t or don’t want to spend too much money on their (first) bike. There a couple of reasons why I decided to buy a Bulls. First of all I have gathered some information on the internet about several brands and types. After years of mountain biking I wanted a ‘racer’ to hit the roads. I didn’t want to spend too much money on it since I didn’t knew if I would like road racing as much as mountain biking. I decided I would go for a new bike, because you never know if a second hand has some latent defects or might show some signs of wear. I also wanted a Shimano 105 Group because it had many good reviews. After setting a price and demands on group set I had two real options left, Giant or Bulls. Both brands known for their low pricing and decent quality. It is not only the bike that is important but also the right size and adjustment so you can sit comfortable on your bike without getting complaints caused by wrong positioning. So it is important to get some help from a ‘professional’ if you don’t know the right sizes and want to sit comfortable on the bike. Therefore I wanted to go to a bike store and get advice and help about the size and adjusting the bike to my body. There wasn’t a Giant dealer close to my home but there was a Bulls dealer close to my home, so I decided it would be a Bulls. I’m using the bike now for over 2½ years and it is still going strong. In this period I only have replaced the chain, wheels and tires. I didn’t replace any other parts of the bike. The frame is still in very good shape and doesn’t show any remarks of wear. The only part of the Shimano 105 Group I replaced is the chain which costs about € 20. In this 2½ years I have ridden about 10.000 kilometers and I give it a revise every two months. That’s just to look if the shifting is still fine, to give the chain a bit oil, making sure if the pads are still good and give the bike a small cleaning. It’s about 5-10 minutes work every two months, so you could say it’s a bike with low maintenance. I also give it a big revise twice a season which contains replacing the chain once every season and a big cleaning which doesn’t take more than 30 minutes. The shifting during the rides is still very smooth and I think I can do another 10.000 kilometers on the bike and the Shimano 105 Group if I try to avoid crashes. The front fork is made out of aluminium and carbon, so it should give more comfort during the ride and less vibration compared to just aluminium or steel. Since this is my first racer I haven’t been able to compare it with aluminium or steel but compared to a mountain bike with suspension I have to say that the comfort during the rides is bigger than I expected on the beginning. With 9,2 kg it is not the lightest bike there is but if you don’t intend to use this bike for racing you won’t notice the weight. The bike accelerates fast and the handling of the bike is –when you have it adjusted to your body- amazing. It is a bike that can be used for all types of rides. It’s good for recreational rides, tours, cyclo’s (for example Marmotte or Les Trois Ballons) and racing (to a certain level). The bike hasn’t disappointed me once. 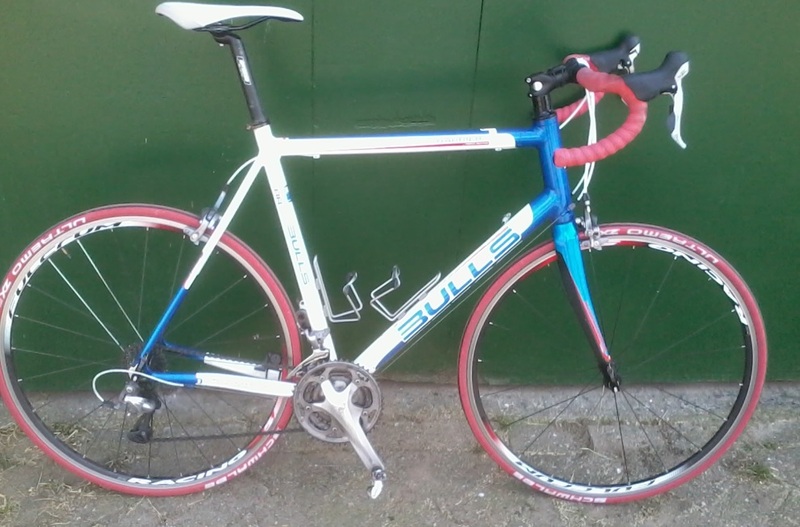 If you are looking for a pretty cheap but solid bike, the Bulls Harrier with Shimano 105 Group is an excellent buy. It’s a very comfortable bike that doesn’t need much maintenance. Like I said before, it can be used for all types of rides, from pure recreational till racing.